Care Instructions: Let soil approach dryness between watering. Do not let roots sit in water. Topiary is the horticultural ability to train and clip plants into desired patterns. The word can also be used to allude to plants that have been shaped in this manner. This practice existed as far back as the time of the Egyptians. It became widely prevalent throughout the highest point of the Roman Empire and, in recent times, in the course of the Victorian Age. There seem to be a renaissance of the practice nowadays, as decorative houseplants keep turning up at fire mantels and the bedrooms of children. 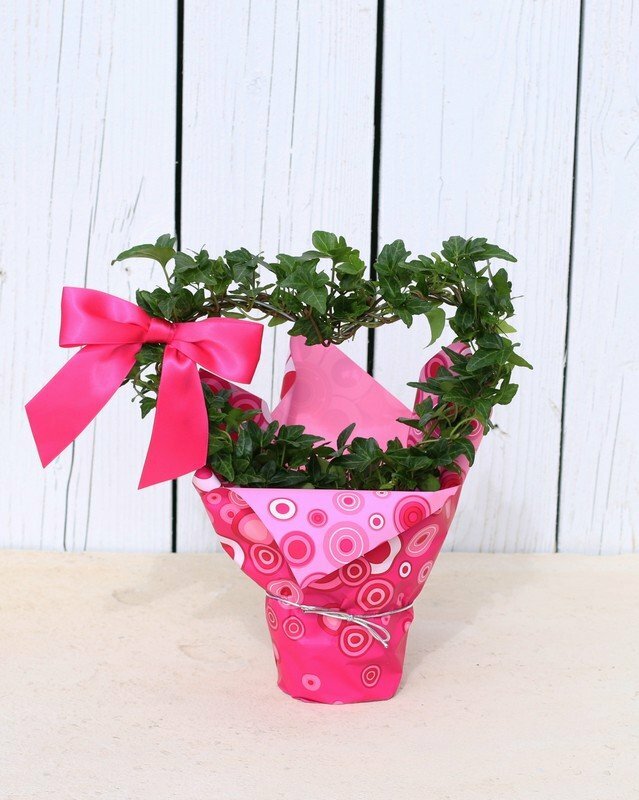 There are lots of assorted types of ivies, varying between the renowned open-air specie and the distinct ivies meant for indoor vessels. The type used indoors comprise of multi-colored (gold-patterned or white) flora or small-sized leaves – Needlepoint Ivy – as well as plants with uncommon shapes like Duck’s Foot Ivy. Indoor plants and topiaries too help to get rid of impurities from the air that flows freely inside the home, thereby enhancing the quality and the level of oxygen in the air. Topiaries can be used to create heirlooms once photographs are placed at the base. Topiaries, as well as plants growing in permeable clay pots or light soils need to be watered every 1-3 days. Water requirement is not much, just about ½ inches of water is adequate. Plants that are growing in regions that are more brightly lit and warmer tend to need more watering than plants that grow in locations that are dark or in cooler dwellings. Care should be taken not to overwater the plant or to allow the soil to dry out completely. Water soluble fertilizers like Osmocote, Miracle-Gro or Jack’s Houseplant Special 15-30-15 can be applied as instructed after intervals of 6-8 weeks. Ivies thrive best in bright areas illuminated with indirect sunlight and indoor temperatures that are cool; spots like a west or east window or even a south window that is clear of any source of heat is good. Avoid areas with intense bright light as well as hot areas. Recall that the angle of the sun changes with the seasons, so you will probably have to change the location of your plant during the course of the year in order for it to get the essential light necessities. Do not overwater the plant or you stand the risk of causing the root to rot. Keep the soil slightly wet every time. Also ensure you do not allow the soil to be completely dry before moistening the soil as this will cause the slow decline of the topiary plant. Examine the plant every week to know its weight per time, and if you have already done your homework regarding the weight of topiary plants per time, when your plant needs to be watered, you will know.